Location: Mullingar, County Westmeath, Ireland. Ownership / Access: Prof. Ferdinand von Prondzynski. Notes: Knockdrin Castle is, according to The Buildings of Ireland: North Leinster (published in London in 1993 and better known as the Pevsner Guide to North Leinster), mainly an early 19th-century neo-Gothic structure. The current castle was largely designed by Richard Morrison (later Sir Richard Morrison) and was built on the site of High Park, the original 18th-century mansion that formerly stood there. The castle was constructed for Sir Richard Levinge, 6th Bt. (1785-1848), probably in the 1810s. The castle is currently the home of the von Prondzynski family. The current owner, Prof. Ferdinand von Prondzynski, was President of Dublin City University from 2000 to 13 July 2010, and is now Principal and Vice-Chancellor of Robert Gordon University, Aberdeen, Scotland. Until the early 18th-century, the main residence on the estate was a small Norman castle (often known locally as 'King John's Castle') which was destroyed by fire. The main part of High Park, the previous mansion that stood on the site of the current Knockdrin Castle, may have been built in the early 18th-century for Sir Richard Levinge, 1st Bt., M.P. (1656-1724), although there were probably further alterations and additions made to the house that were completed by the late 18th-century. The Levinges came to Ireland with the Williamites, in the late 17th-century. The first Sir Richard Levinge was Chief Justice of the Common Pleas and a member of the Lords Commissioners, who were appointed by the Crown to settle all the land questions which had arisen in Ireland after the Cromwellian conquest, the Restoration and the Williamite Wars. 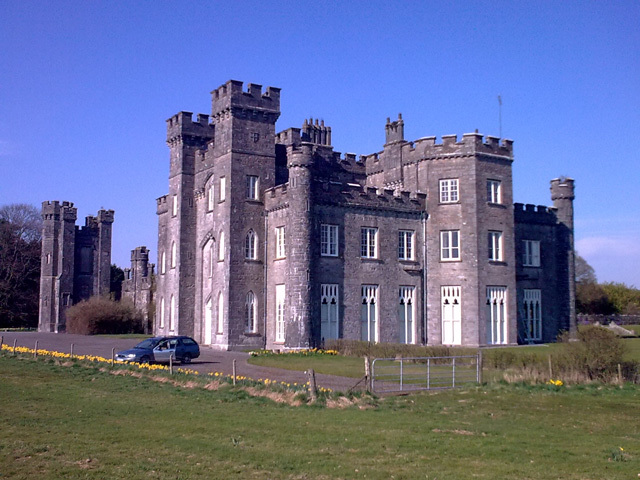 Sir Richard took advantage of his position to purchase the Knockdrin Estate from the Tuites, who were the Norman-Irish owners up to that time. At the time there were over 12,000 acres (49 km2). The present estate of about 1,000 acres (4.0 km2) was laid out as a hunting ground. Lord Randolph Churchill and his wife, Lady Randolph, parents of Winston, were frequent visitors. Jennie Churchill declared that the foxes were as wild as the locals. Winston Churchill himself privately visited the castle during the War of Independence. During World War II, the castle was taken over for troop accommodation and was occupied by a company of the 6th (Dublin) Infantry of the Irish Army. The Army left in 1945 and handed the castle back to the Levinges. The Levinges owned Knockdrin until 1946, although the last Sir Richard Levinge to live there (later a Director of Guinness Ltd.) had by then not been resident there for some time. In that year the estate was sold to Paddy Dunne-Cullinan, who remained there until 1961 when he in turn sold the estate to Hans Freiherr von Prondzynski, and his wife Irene Freifrau von Prondzynski, from Germany. The arable land is now leased out but the family continues to live in the castle. Until the very early 19th-century, the castle and estate were called High Park. The property was then renamed Knockdrin, after a hill on the estate; the name is also related to Lough Drin, a small lake on the estate. The Irish name for the locality is Muine Liath (pronounced Moe in ah lee ah), which means Grey Shrubbery. Muine Liath is written in English as Monilea.